Associated Press Maj. Gen. John C. Harris Jr., the new adjutant general of the Ohio National Guard, says the new fitness standards will be difficult, but needed. COLUMBUS, Ohio – The two-star general now in charge of the Ohio National Guard poked himself in the chest as he spoke about the tough new physical-fitness standards being implemented across the Army, to emphasize that it's all about being a warrior. The married father of three grown children acknowledges that his route toward a military career was a bit circuitous: As a saxophone player and multisport athlete at his high school near Cleveland, he asked the head majorette to teach him to twirl a baton so he could try out for drum major with the Ohio State University marching band. He entered college as a music education major, and he did perform as assistant drum major in 1984 and 1985. “I don't tell the Army guys that I twirled in high school,” he said with a laugh. “I was looking for a leader with great judgment. I want those who work for me to do things differently. He thinks outside the box,” DeWine said. Harris said his organization is “on the right track,” but he knows challenges lie ahead. The physical-fitness test being developed for the Army will require longer runs and more difficult push-ups, and adds sled-drags and dead-lifts, medicine ball throws and feats from a pull-up bar. 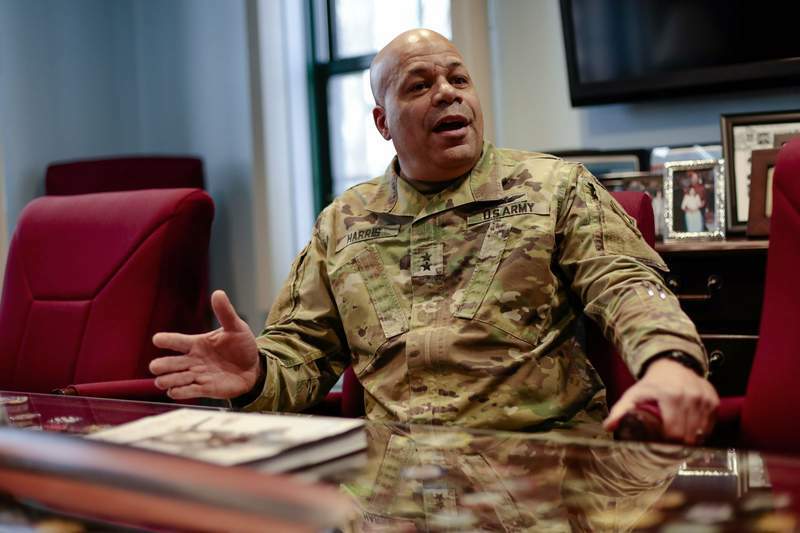 Harris plans to ensure that the Guard remains an operational force and doesn't revert to the days when it was considered only a strategic reserve. And he must integrate women into combat and navigate the waters of whatever the highly debated policy on transgender people who serve will finally be.